Growing up in southern New Hampshire, I rooted for the Boston Red Sox. Most New England schoolchildren in the 1970s and 1980s knew the names of big hitters such as Carl Yastrzemski and Wade Boggs, catcher Carlton Fisk, and pitcher Roger Clemens. My parents weren’t huge sports fans, but every once in a while we’d make the one-hour drive to Boston to catch a summer game at historic Fenway Park. Inside the park, I enjoyed eating the giant hot dogs (“Fenway Franks”) and popcorn (pronounced “PAP-con” by Bostonians) as much as I enjoyed actually following the game. Even as a 10-year-old, I could appreciate the park’s intimate feel, the old-timey manual scoreboard, and its high left-field “Green Monster” wall. 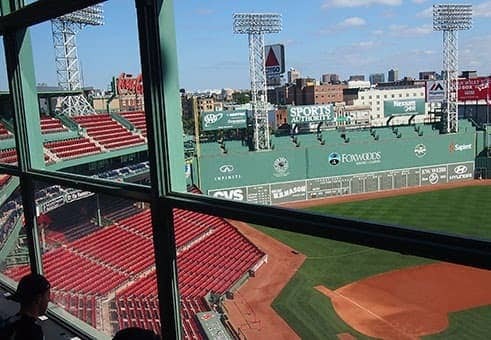 A few decades after first setting foot in Fenway Park, built in 1912 and the oldest park in Major League Baseball, I took an hour-long tour of the home of the Red Sox to learn about its legendary past. Even if you’re not a diehard member of Red Sox Nation, baseball fans (in general) and history buffs will enjoy this insider look at one of the most storied—and smallest—ballparks in the United States. Over the course of the tour, knowledgeable tour guides outlined the park’s quirky features and shared funny stories with great enthusiasm and entertaining commentary. Here are some of the highlights. The Red Seat. One lone chair in the green right-field stands has been painted bright red to commemorate the 502-foot homer Ted Williams blasted there in 1946. This remains the longest home run ever hit at Fenway. The ball struck the head of a 56-year-old fan from Albany, New York, boring a hole into his straw hat; he walked away, famous and (relatively) unscathed. Viewfinder Tip: A slew of sports bars surround Fenway Park; check out Boston Beer Works, which serves “chowda,” savory beer-dough bites, and at least a dozen beers on tap. Pesky Pole. This pole (also known as Pesky’s Pole) on the right-field foul line stands just 302 feet from home plate, the shortest distance (right or left) of a foul pole in any major-league ball park. In 1940 Red Sox owner Thomas Yawkey redesigned the right-field line, shortening it from 325 feet to make it more homer-friendly for rookie Ted Williams. Despite this history, the pole is named for Johnny Pesky, who was a shortstop and left-handed hitter for the Red Sox in the 1940s and 1950s and went on to become a beloved coach, manager, and announcer. Press Box. As a long-time journalist, I loved our peek into the glassed-in Press Box on the top level of the stadium, right above home plate. The bird’s-eye-view press area seats 100 journalists and broadcasters, and the four tiered rows of seating are doled out based upon seniority, with longtime local Boston writers commanding the front seats. These stalwarts are flanked by the official scorer, who sits with a television screen to review plays as needed, and the statistician, who feeds the reporters key facts and stats. While baseball stadiums typically are not on the top of my to-do list during city visits (I’d rather engage in sports than watch sports or learn about their history), touring Fenway Park was a (really) cool experience. It reminded me to consider more out-of-the-box sightseeing options on upcoming trips. It also showed me how fun it can be to try something a little out of “my” ordinary when I travel. What sorts of sightseeing options do you seek when you vacation?